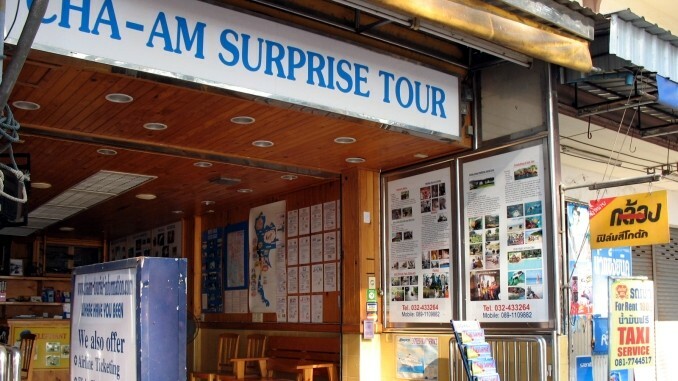 Tourist information in Cha-Am is quite poor, and you have to rely on hotels and travel agencies rather than official information points. When an event is held in Cha-am, most time the posters are in Thai language only. This is one of the reason why we opened this website! As far as we know there are two official information points for tourists. One is the TAT (Tourism Authority of Thailand) office, but it is about 1 km far from central Cha-Am in the direction of Hua Hin (on the right side of the road), and you won’t find much information there, except a few brochures. But the staff is welcoming and they speak English. The other information point is the police station located at the end of Narathip road, just between North Cha-Am and South Cha-Am. It is supposed to be an information point for tourists, but it is in fact a police station and there is no sign in English, so you don’t feel like going in there and ask for advice concerning a hotel or a restaurant. You can find a city map there, though, as well as a small brochure with the main attractions in and around Cha-Am. There is also a special telephone number for “Tourist Information Inquiry”, which is 1672. Several travel agencies can be found along the beachfront, and hotels and guesthouses also propose tours and excursions. What nonsense. Yes there are many dogs but they are harmless. We have cycled everywhere and not one dog has even barked at us. They certainly have not been aggressive and we have not even heard of someone being chased, harmed or bitten at any stage. People just become so damn paranoid. Yes dogs are everywhere and people get bitten on a daily basis, but nothing is done to solve the problem. They just stand and wonder “why it is so quiet” and “where have all the foreigners gone”. Getting rid of the dogs would make Cha Am a wonderful place, where people could walk or ride a bicycle without having to end at the hospital getting rabbies shots.